On the first Sunday of each month we gather for a time of word, worship & communion. A chance to engage with the Bible and to think and relate it to our lives. Gather all together on a Sunday morning. All ages gather together to meet with God. 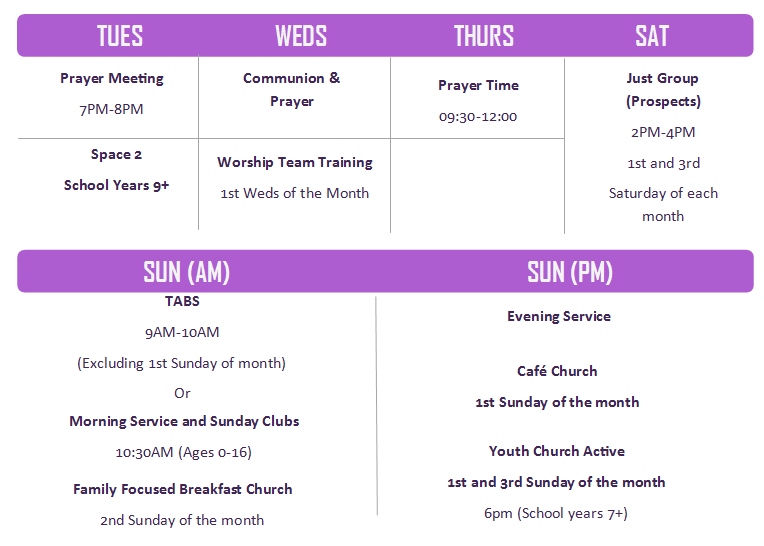 You'll find sung worship, prayer, teaching & a whole host of other things. There is also age appropriate teaching and activities for the children. A chance to gather together on a Sunday evening in an informal setting. Worship, prayer, teaching, space, hopefully some creativity as well. On a Wednesday we meet in the Chapel to share Communion together from 1.00-1.30pm. We also meet on Tuesdays from 7.30-8.30pm. Regularly meet in homes to explore faith and life and to see what God is saying. It's a chance to meet in smaller groups and to share lives at a closer level. Most of these are on Wednesday evenings but there are a few that meet on different days & at different times. Contact the Church Office to find out more.